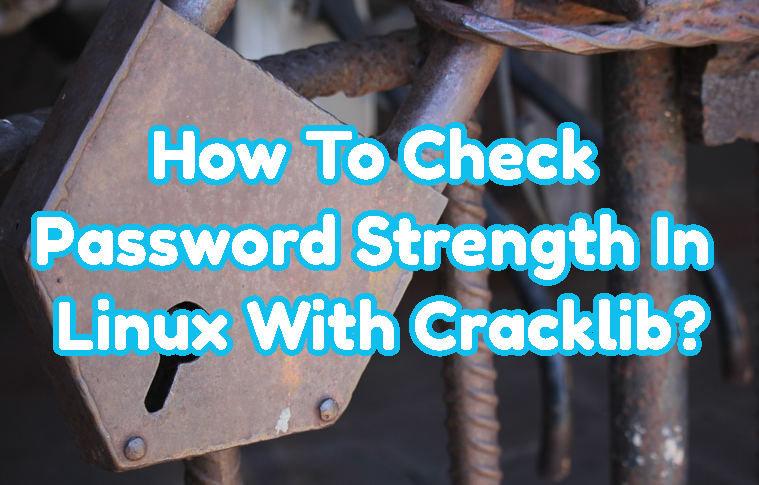 How To Check Password Strength In Linux With Cracklib? Password security is important subject in IT. We call it password but actually it is a key to enter systems. Making authentication password-less by using key based authentication is more secure but it is not always possible. So for the password based authentication password strength is important. Actually making passwords strong is easy. Important thing is making this as default behavior. Just typing more 5 character will make our systems like a castle. We will install cracklib-runtime package with the following command for Ubuntu, Debian, Kali and Mint. cracklib is the package we will install in Fedora, CentOS, RedHat. There are different tools provided by cracklib but the most useful and important one is cracklib-check command. We will provide the password we want to check to the cracklib-check command as standard input. We will check the password 123456 which is insecure as we know. it is too short message means we need to use more characters than given password. If the given password is secure the OK message is printed to the screen. If checking passwords one by one is long process we can check password with a single run by providing them from a file. In this example we will write all passwords into file named pass and redirect to the cracklib-check command like below. How To Set, Get and Change Bash Environment Variable? How To Change OpenSSH SSH Server Port Number In Linux?